Located in the charming Breton town of Pont-Aven, the 3-star hotel La Chaumière Roz-Aven extends a warm welcome. The building, dating from the XVI century, skilfully combines old-world charm with the comfort of a modern hotel. This cottage, typical of Finistère, with its thatched roof and granite stones, lies on one of the banks of the Aven, giving it an authentic charm that its visitors enjoy. The proprietors : Valérie and Alain Bodolec, who are born and bred Bretons, welcome you to their village in the heart of a splendid ria, where the coastal air mingles with the light of the surrounding countryside. La Chaumière offers 14 rooms, all overlooking the river or the garden. A quiet, relaxing stay, steeped in history with the treasures of Pont-Aven: town of the artists and poets who found a source of inspiration here. La Chaumière Roz-Aven, a 3-star hotel in Pont-Aven, on the Avenriver, a coexistence of historic dwelling and modern hotel. 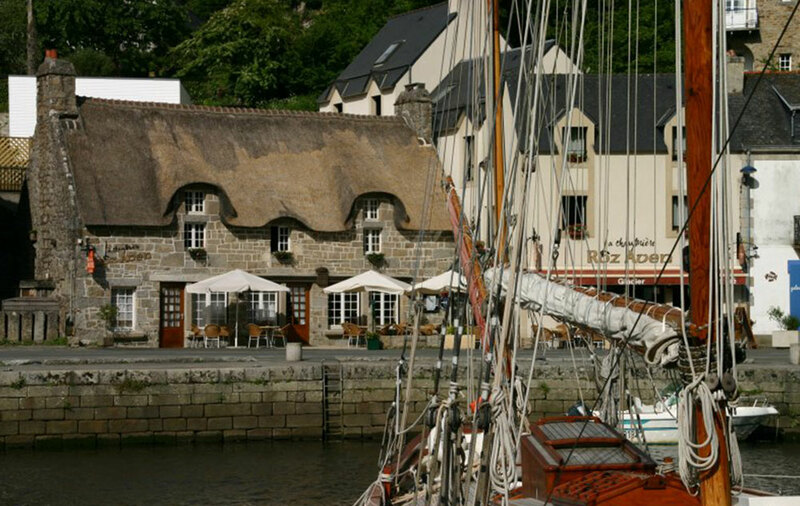 Charming hotel in Finistère, Accommodation Pont-Aven.